It started as a conversation between myself and Brian Burden. We had both been talking with expansion clubs for the 2019 NPSL season and were comparing notes. Brian came up with the idea and pitched it. What if we followed these two clubs over the course of this season. Got close with the people involved, discussed the process of building a club from scratch, week by week. He came up with the idea and I named it, “Expanding the Map.” Over the next year, we’ll be working with two expansion clubs in the NPSL, each of us producing an installment article every two weeks on what the club is working on, dealing with, planning. The clubs are coming from different levels of development and vastly different parts of the country. Today is my first installment of Expanding the Map: Denton Diablos. Putting together a team from scratch seems incredibly complicated from the outside looking in. Discussing that process with Damon Gochneaur, co-owner of the Denton Diablos, doesn’t make it seem any less complicated. What is clear, however, is that there is a plan for the club and they are ticking boxes off as they move towards the opening match for this expansion side. The first and biggest focus of the club currently is staffing the team with players. 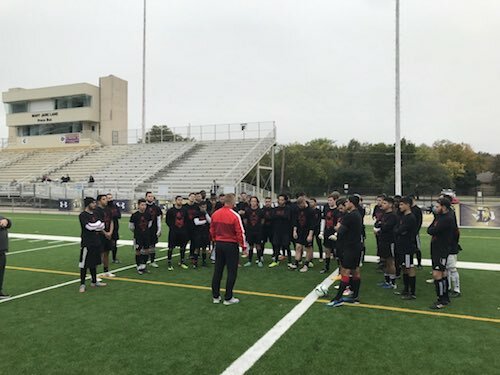 To get there, the team has been holding open tryouts in Denton, looking for the right mix of players to field a competitive side in a conference full of strong teams. Two open tryouts have already been held with one more to come on the 17th of February. The tryouts that have been held have sold out and the upcoming one is on track to sell out even faster than the previous two. Two weeks out and the slots are already halfway filled. I’ve always been curious about paid tryouts, if they are money makers for clubs, so I probed a little on how much was being charged. Denton charges $50 for entry. But Damon was quick to offer that there’s more value being offered than shot at a roster spot. “Every player gets two tickets to a home game of their choice for the Diablos’ regular season. We give them a t-shirt as well. The fee goes to the staff and actual physical logistics it takes. What I tell every kid that tries out, ‘If you come back to the club, this is the last money we’ll ever ask of you.’ Talking to other clubs at the annual owners meeting in December, if you go too low [with the fee] you get kids that aren’t qualified.” The tryouts do require a large number of staff present. At each tryout there’s 6-8 staff members, a head coach, a general manager, and one of the owners. Denton is taking the approach to roster building in an interesting fashion. The goal is to carry a player pool, somewhere over thirty players, to offer the club flexibility for its game day roster. The players will “train, get equipment, be officially registered with the club, the whole nine yards.” The players will be competing for the starting eleven throughout the season. The club has 23 players signed and rostered, so the pool still has room to grow through the upcoming open tryout. Those already on the squad include players with “national team experience, MLS experience, international club experience. Guys are current NCAA All-Americans and local standouts.” That description certainly sounds as if Denton will be competitive from day one. When I asked Damon about the schedule for the season, he mentioned that he didn’t want to reveal any information that wasn’t public. However, while the schedule isn’t public yet, he was willing to tell me that the beginning of May will see the first matches played in the 2019 edition of the Lone Star Conference. As Gochneaur described it, moving back from that match, the club plans on playing several friendlies in the second half of April. Which clubs will face off against Denton remains to be seen, but Gochneaur did offer that Denton’s opening regular season match would be against a conference opponent, but not against local rival, Fort Worth Vaqueros.